The Savoy: World’s Finest Ballroom – Swing or Nothing! The Savoy Ballroom in Harlem, New York City was a popular dance venue in the 1920s through 1950s and played a pivotal role in the development of swing dancing and music. Simply put, it’s where Lindy Hop became famous. Located between 140th and 141st Streets on Lenox Avenue, the two story building housed an enormous ballroom on its 2nd floor that spanned an entire city block. Billed as the “World’s Finest Ballroom”, it sported luxuriously carpeted lounges and mirrored walls, and employed bouncers in tuxedos as well as dance hostesses who would teach you the latest dance steps for a dime. The downstairs checkrooms could efficiently service as many as 5000 patrons on a night (the ballroom welcomed about 700,000 guests annually). The ballroom had nicknames around town. Downtown crowds named it “the Home of Happy Feet”, while uptown crowds called it “the Track” for it’s elongated shape. Upon walking through the entrance to the building at the middle of Lenox Avenue, guests would ascend the central staircase to the dance floor. There were two bandstands along the eastern wall, and with two bands playing back-to-back, the music was continuous all night long with one band picking up where the previous one left off without missing a beat. Remember there were no deejays or loudspeakers in this era! One minor form of “segregation” did exist though…the best dancers in the house would congregate in the northeastern corner near the bandstand where these swing virtuosos would put their skills on display. Although this spot of the floor did not have a name at the time, it was later called the “Cat’s Corner” after the talented “cats” who danced there. Frankie once recounted that he had to work his way up to dancing at the Savoy, due to the level of dancing there; he started out dancing at some of the easier ballrooms such as the Alhambra and Roseland. 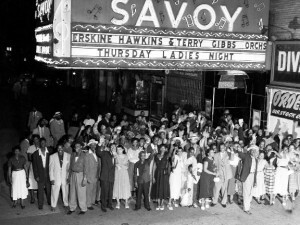 In terms of music, the Savoy hosted several house bands including those of Fess Williams, Chick Webb, Erskine Hawkins and Al Cooper. Two famous music events were the “Battle of the Bands” or “cutting contests”, one in 1937 between the bands of Chick Webb and Benny Goodman, and another in 1938 between Chick Webb and Count Basie’s Orchestra. 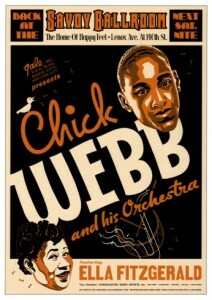 Chick Webb’s band won both contests, although some who attended disputed the 1938 result. 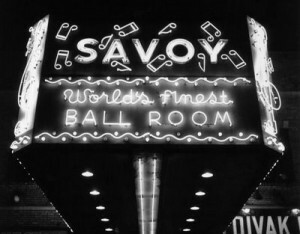 In addition to being a popular home for social dancers, the Savoy Ballroom was also the home of several Lindy Hop dance teams, including those formed by bouncer and stage-manager Herbert “Whitey” White, an ex-boxer. Young up-and-coming dancers like Frankie Manning, Al Minns, Pepsi Bethel, Leon James and Norma Miller were allowed free daytime access to the ballroom floor, oftentimes while the bands were rehearsing. In more ways than one, the music and dance grew up together. Whitey’s Lindy Hoppers went on to perform across America as well as in several Hollywood films. The Savoy Ballroom opened its doors on March 12, 1926, and closed them on July 10, 1958 making way for a new housing complex. Some historians theorize that the development of hi-fi recording and playback technology such as records, radios, televisions and jukeboxes reduced the need for large public dance spaces. 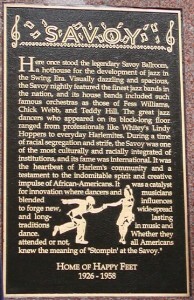 On May 26, 2002, a plaque commemorating the historic ballroom was unveiled by remaining Whitey’s Lindy Hoppers Frankie Manning and Norma Miller at the spot where the entrance once stood.